You can see all the raw photos here. Because bus service from Fresno to SEKI was discontinued in 1986, I had to rent a car in Fresno and drive up to the park. This has been an extra expense, and gives both more and less flexibility (since I have to return to the car). It will eliminate any further adventures at the airport or on the trip to the park. The focus of this trip was to explore Ferguson Canyon. I have looked down the canyon from the Tablelands, and have spoken to backcountry rangers about it. One ranger told me that it was one of the most little-used areas of the park, that only a few groups go in there every year. My plan is to enter the canyon at the bottom and emerge at the Tablelands. A loop from Cedar Grove through Ferguson Canyon, looping back through Cloud or Deadman would give me the opportunity to make another attempt on Mt. Brewer, if conditions are right. The trip from Cedar Grove over Avalanche Pass was unremarkable. 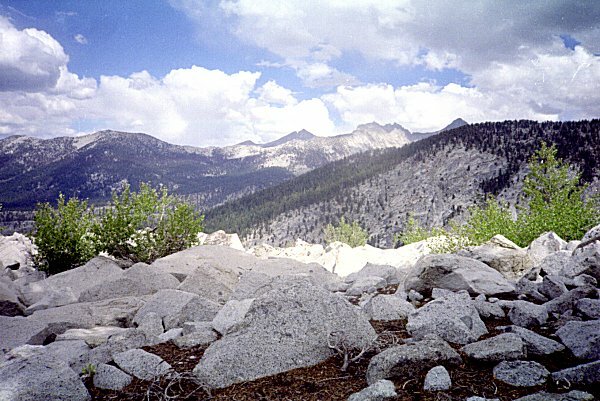 Passing Roaring River and heading up Deadman Canyon, I began to see the canyon wall I planned to climb to get into Ferguson Canyon. 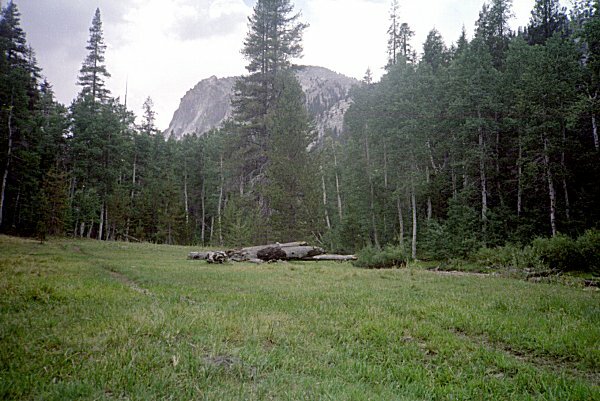 I planned to pass Palmer Mountain, climb up out of Deadman Canyon, pass through Scenic Meadow, and head down into Ferguson Canyon. The climb up the canyon wall was steep and long, but it was through wooded terrain, and whenever it got too steep for me to walk, I could grab onto a tree or bush and pull myself up. The maps do not show a lake, only a stream. 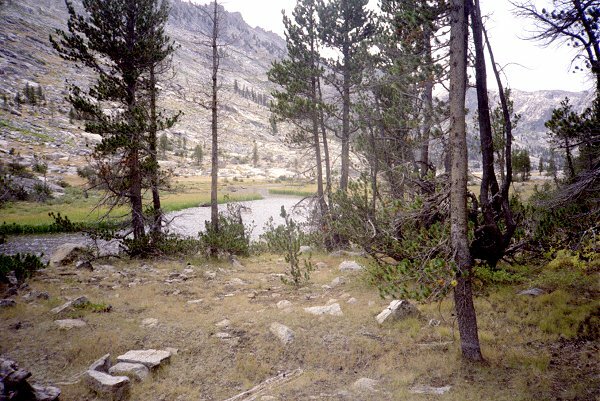 But I found this charming lake to camp near, in the vicinity of Scenic Meadow. 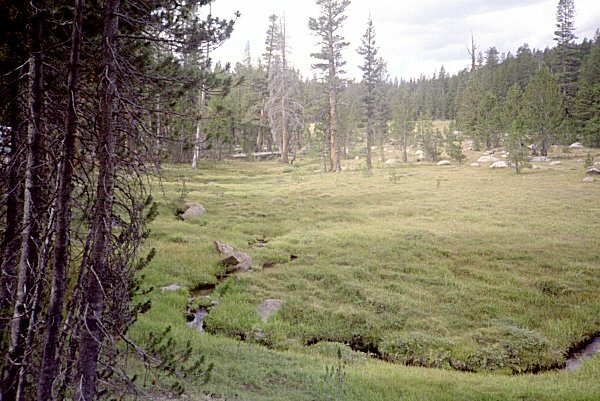 The meadow was steeply sloping in most places, but opened out occasionally to reveal the mountains around. This was very pleasant hiking, a good place to be as I finally lost my compulsion to hurry along. 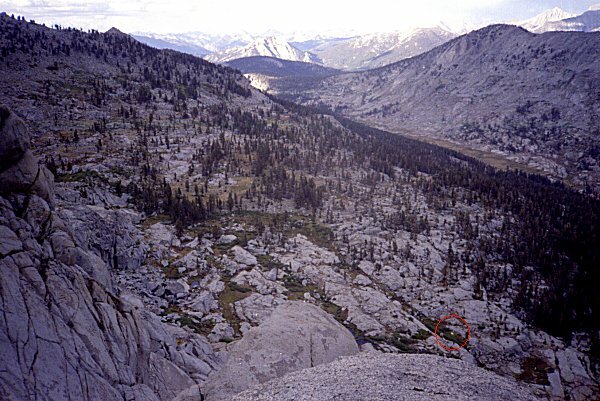 This was my first glimpse of Ferguson Canyon, as I passed through the gap south of Barton Peak. I could see all the way up the canyon, to its head. The Tablelands lay beyond. You may notice the lack of blue skies, or even identifiable clouds in many of these pictures. This is because the weather was mostly overcast, threatening to rain all week. Other than a few brief showers, it did not rain until much later. More on that in due time. This is what Ferguson Canyon looks like. It was pristine, dry, with sparse tree cover. It was relatively flat and easy strolling. I left my camp set up, and explored ways to get out of the canyon. I could not tell for sure from the maps how hard it would be, but I managed to find an easy route to the top, going to the right of the little knob here. This shows Ferguson Canyon from above. The canyon is in deep shadow, for the sun is near the horizon. The saddle that I cam over is in the middle distance, with Barton Peak to its left in sunlight. My tent is about one pixel wide in this photo, in the red circle. 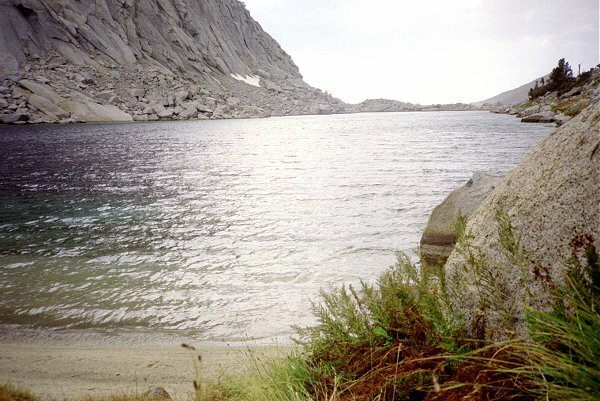 Once on the Tablelands, I followed the ridge, passing my favorite lake above Big Bird. From there, I headed to Pterodactyl Pass. Then I headed to Lonely Lake. 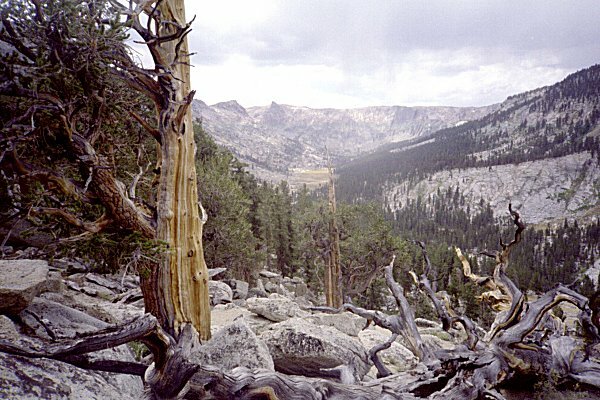 The view here is looking east, toward Deadman Canyon and Elizabeth Pass. Looking west, the wind and the impending storm are evident. Nevertheless, there was no more than 10 minutes of light rain that day. 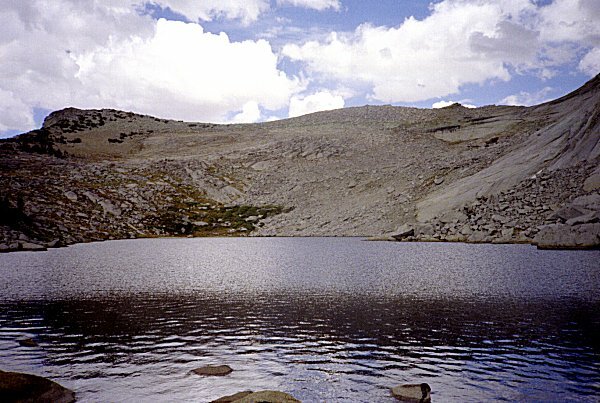 From Lonely Lake, I crossed into upper Deadman Canyon, skirted around its head, and climbed up to the copper mine. 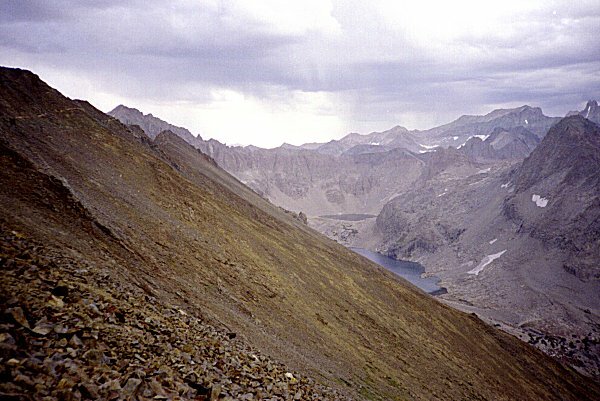 From there, the Coppermine Pass trail (visible to the far left just below the ridgeline) provides a spectacular crossing into Cloud Canyon. The best part of this trail is how it affords great views of deep valleys on both sides. 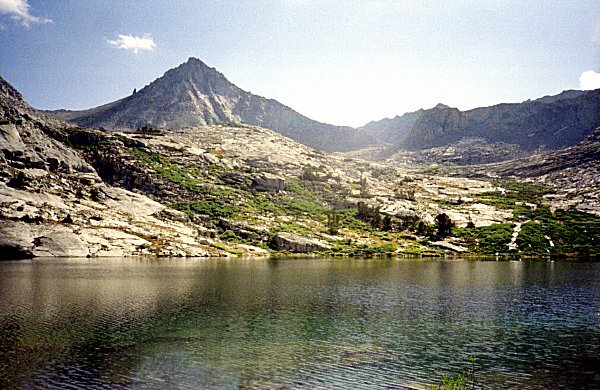 This is Lion Lake and the Kaweah Peaks Ridge. 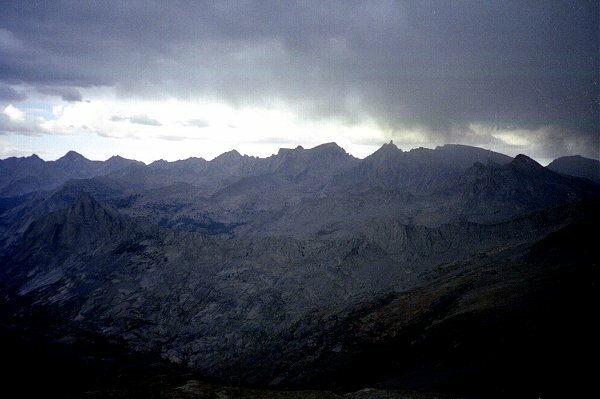 I had thought about attempting Triple Divide Peak, but the storm clouds that enveloped it quickly put that idea out of my mind. 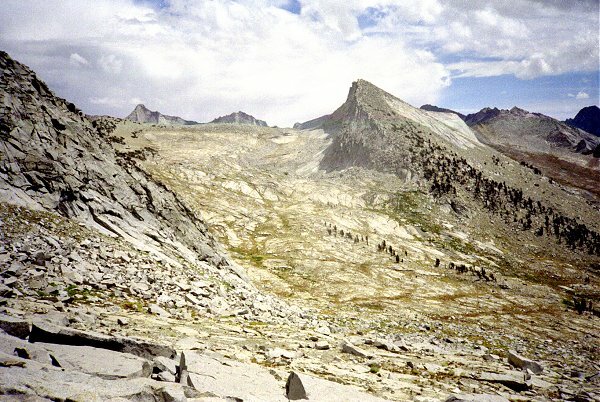 This view of the Great Western Divide, with Milestone Mountain to the right of center, give some hint of what it looked like in the middle of the afternoon. 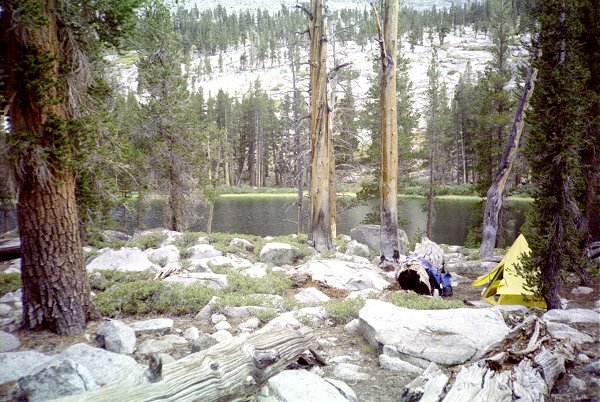 I headed directly down to the floor of Cloud Canyon, and camped at the old miner's camp. Again, despite all the clouds, I saw scant precipitation. 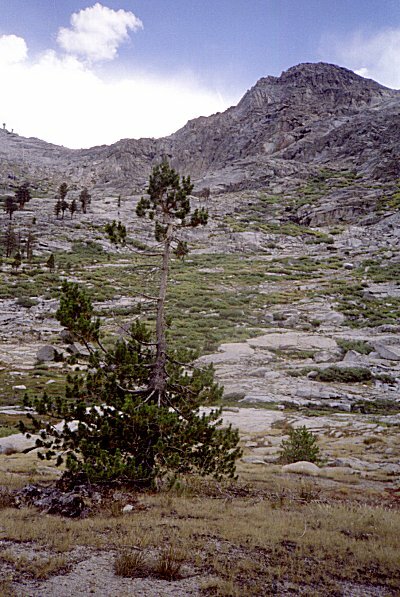 After heading down Cloud Canyon, I followed the trail up to Moraine Meadows. From there, I headed along Moraine Ridge a half mile or so and made camp. I was determined to climb Mt. Brewer from there the next day. I got up in the early morning twilight, fixed a hasty breakfast, and headed up the ridge. As I passed Big Brewer Lake and my high point from my previous attempt, I was feeling confident. It was still early, the weather was clearer than it had been all week. and I was feeling strong. This shows Mt. Brewer and the route (to the left of the smaller tower) to the foot of the peak. 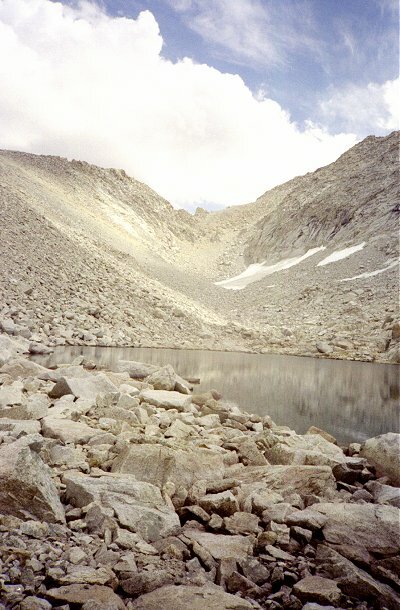 I reached the headwaters of Brewer Creek, the lake at the south face of Mt. Brewer by noon. I had made up my mind to turn around at 2:00, so I still had a shot at reaching the summit. Note that the clouds were building up but still looked benign. The weather would not hold for long, though. Soon clouds enveloped the peak. As I reached the main ridgeline separating Brewer Creek from East Creek, I realized that the other side of the ridge held much thicker clouds. These had been blowing over the ridge and dissipating, but now grew thicker and thicker. I kept ascending, more and more quickly. As I caught sight of the summit, no more than 50 feet away, thunder and lightning broke out and the hair on my arms began to stand on end. As I pondered what to do next, I noticed little sparks coming off my fingers to the rocks nearby, and a strange hissing sound. 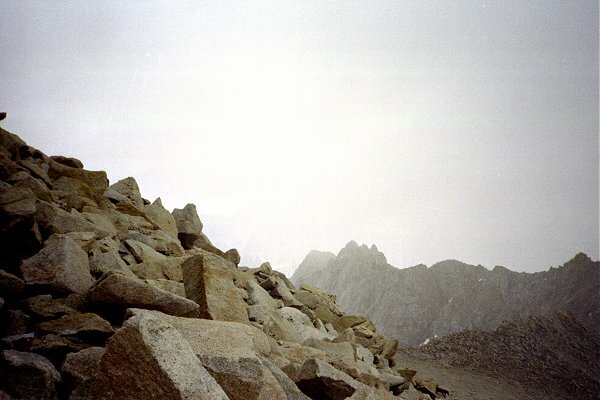 When I reached my camp on Moraine Ridge, it was getting dark and I was exhausted. It had rained off and on all the way back from the peak, and in my absence some water had leaked into my tent through the floor. Everything was either wet or damp, and I was too tired to make dinner, so I just lay down in the damp sleeping bag and fell fast asleep. The next day as I checked out at the trailhead, I asked the ranger about the storms that I had experienced all week. He said that they had not seen a drop of rain there for 62 days running. 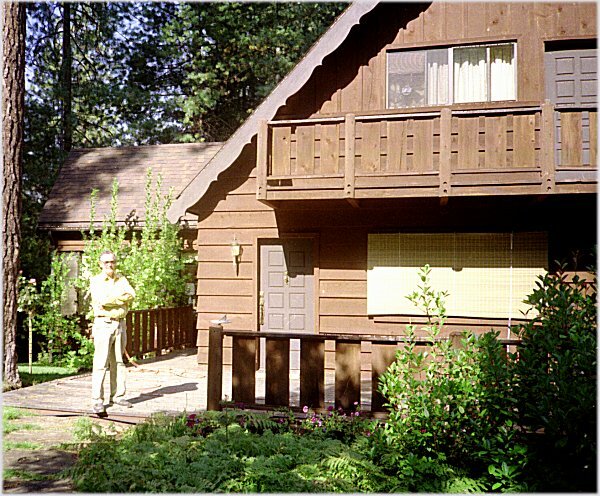 After I finished the trip, I paid a visit on Dennis James, a colleague who had retired from Bell Labs in New Jersey to a cabin near Oakhurst, near Yosemite. He and his wife fed and entertained me graciously, and let me dry out all my stuff (which was mostly still wet). Thanks, Dennis.